HiPoVacc - Platinum Cured Silicone Hose Reinforced with SS 316 Helical Wire | Mumbai ,India from Himsan Polymer Pvt. Ltd.
We are offering wide range Extruded Rubber Profiles to our clients which have earned us loads of appreciation in the market due to their applicability in varied industrial sectors. We have been engaged in offering best in class Rubber Diaphragm. These Rubber Diaphragm are manufactured using the latest tools and techniques under the strict surveillance of our experts. Furthermore, our employees test these on predefined parameters to ensure a defect free range is dispatched to clients. We can manufacture rubber gaskets to any dimensions and in any shape, from any type of rubber. Whether you are after a standard part, or something bespoke, simply give us a call or send us your drawing, and we will be happy to offer you a quotation. HiPoVacc is Platinum cured Silicone hose reinforced with SS 316L Helical wire. It has better transparency to visualize flow and kink resistance. HiPoVacc is designed for material transfer application under high vacuum in pharmaceutical industries. 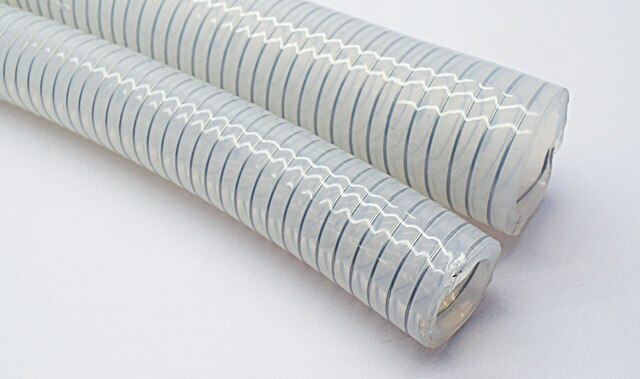 The product is more superior compare to HiPoFlex - polyester braided hose in high pressure & high vacuum rating applications. It is also used for anti-static application. Leveraging on the competence of our skilled workforce, we are engrossed in the business of bringing forth a vast consignment of DIN and SMS Gasket. Using top class basic material along with modern amenities, these gaskets are made with perfection. Also, these DIN And SMS Gasket are shipped by us in top class packing material to our customers. HiPoLine (Silicone Rubber Bi-Colour Tube) is used for color coding to avoid cross contamination problems while using it in multi products. These Silicone Tubes are Complies with FDA 21 CFR & USP Class VI HiPoLine Color Stripe Silicone Tubing is available with variety of choices of color striping: red, green, white, blue, grey, yellow and black and available in custom sizes Whether you want to recognize your lines at a glance by application, tubing size, or functional area, HiPoLine Stripe Tubing gives you the flexibility to create your own system. Since our inception in this highly competitive industry, we are readily betrothed in the domain of presenting to our customers a wide consignment of Peroxide Cured Silicon Tubing. Using top class components and modern machinery, these offered products are developed with perfection. Also, these are well tested before getting delivered at the end of our customers. We are regarded as one of the distinguished names of the country affianced in the domain of bringing forth a top class collection of products comprising Peroxide Cured Silicon Tubing, Platinum Cured Braided Hoses, Platinum Cured SS Braided Hoses, Inflatable Gaskets, Silicon Sheet, Rubber O Rings, Silicon Bellow, Oil Seals, Silicon Chords and Industrial Corks. Made up and developed with perfection, all these are accessible with us in different stipulations and at most affordable rates. Food & Pharma grade, platinum-cured Silicone is widely accepted in pharmaceutical and biotech applications and is often used throughout the plant. Like all of our diaphragm materials, our Silicone diaphragms meet USP Class VI and FDA 21 CFR 177.2600 standards.